Thank you for visiting our site and we are greatly honoured to have you in here as we put our customer’s first. HR Terrys now operates from London, providing service across UK, USA and Europe. 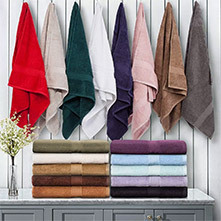 We are your next door Import & distributor but truly a manufacturer who offers a world class premium towels at a factory price. Our manufacturing facilities are based out of Southern India, warehouse and distribution centres in London. Our unique supply chain model cuts down several intermediary exchange and helps us to share the benefits directly to our customers with a high quality, premium towels in a competitive price and a world class service. HR Terrys is dedicated to providing an extensive range of performance, specialist and luxury products to leaders in hospitality, healthcare, laundries and retailers around the world. We offer a broad range of superior quality products specifically tailored to meet your needs. HR Terrys have established overseas offices that each have a team of local national people employed by HR Terrys. Our colleagues on the ground in India are all textile experts with vast experience in developing, sourcing and buying products that we are confident will meet your requirements, whilst maintaining value for money. Having overseas offices with local employees based in the manufacturing countries are key to the success of all the brands within the HR Terrys.